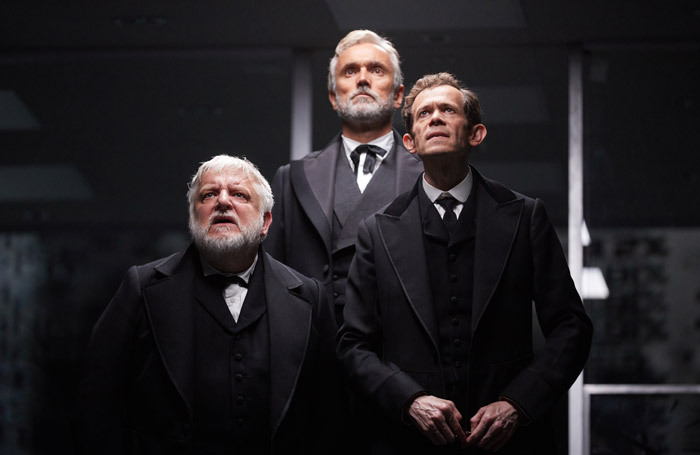 The National Theatre has announced that The Lehman Trilogy will transfer to New York next year. The production  charts two centuries of the Lehman family – from their arrival in the US in 1844 to the collapse of the financial firm in 2008. Written by Stefano Massini, it was translated into English – and adapted by Ben Power – for a run at the National Theatre earlier this year. It will transfer to the Park Avenue Armory in New York, where it will play in a 55,000 sq ft drill hall. Adam Godley, Ben Miles and Simon Russell Beale will reprise their roles. The play is directed by Sam Mendes, and produced by the National and Mendes’ Neal Street Productions, in collaboration with the Park Avenue Armory. It has design by Es Devlin, costumes by Katrina Lindsay, lighting by Jon Calrk, sound by Nick Powell and video by Luke Halls. Movement is by Polly Bennett and the music director is Candida Caldicot. The Lehman Trilogy will run from March 22 to April 20, 2019.